Hi. I'm pretty new to all this so it might just be me...but... 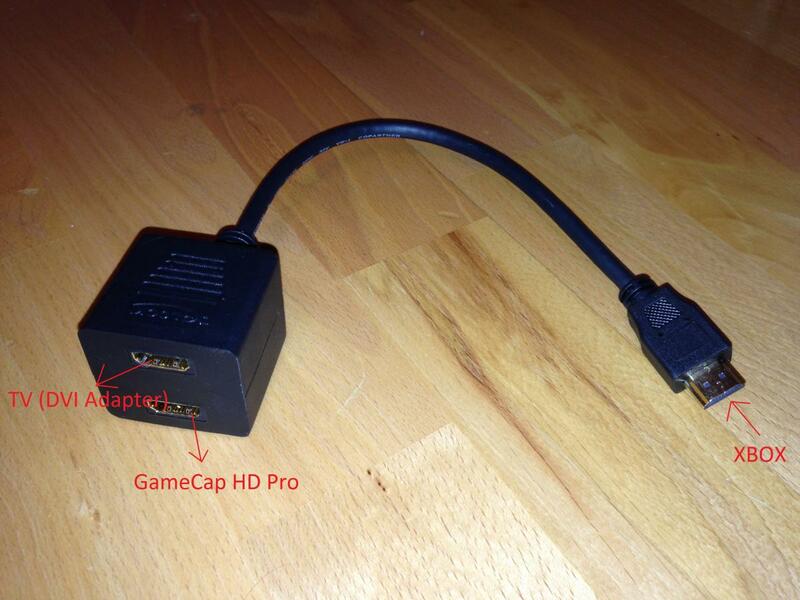 I just got the hd pro capture card today and I hooked it all up using only hdmi cables. Xbox > HDMI > Capture card > HDMI/DVI cable so that it can be used in my PC monitor (no hdmi input - just DVI). I have always just used xbox > HDMI/DVI cable > PC Monitor and it works perfectly. Once I put the capture card in, the screen is all red and no amount of changing the xbox settings and/or monitor settings is fixing it? It appears perfectly on my capture preview on my other pc screen (except for a little lag) so I don't know what is happening? Any suggestions? I've spent ages trying to work out what I'm doing wrong. Sorry I should clarify "all red". The screen is actually a red tone (i.e. no colour) but the sharpness of the images/menus, etc is fine. When I pull the capture card out and put my HDMI/DVI cable directly into my xbox again, it works perfectly as always. Hard to guess without a better picture of what is going on??? Can you post a picture or 3 of the wiring and maybe a screen cap? ALSO... did you install the Roxio Software before you ever plugged in the capture device? If your preview is working (lag is normal) then your output should also be fine. I expect the issue is with the HDMI to DVI conversion. Try using a normal HDMI output cable to a different target? Like say a TV in the house? This will at least tell us where the problem lies. ^^^ Yeah OK, I'll try it all on a tv. The HDMI to DVI conversion works perfectly when the capture card is not used however. From memory I plugged it all in while the software was installing but the instructions didn't say otherwise (i.e. there was no order stipulated). Should I have installed the software after plugging in all the cables, etc? If so, should I un-install everything and start again? Thankyou both for your help. Is there anyway you can test using just an HDMI without any adapter??? Sorry for that. I'm not a native speaker, but thanks for pointing it out. I'll try to get it right in the future. I DO NOT KNOW as far as adapters go... I know several years ago I tried a an HDMI to VGA so I could run my laptop on an older (VGA) monitor but it did not work! I suspect (and I reiterate that I do not know!) that the DVI to HDMI works but not when going from HDMI to DVI??? Can anyone else speak to that? Yes, the photo you put up is the same colour issues I'm having. I tried so many different settings and got nowhere. I've ordered a RCA to DVI cable and am just waiting to see if that works. Fingers crossed. Let us know how your adapter works for you if you get he chance? Well... I just got my HDMI splitter, and surprise: it does not work... My TV receives a correct signal now, and the image looks great, but the capture card doesn't get one... I just sent it back and will order another, cheaper, passive one. (The one I had now was active and activated one or both ports only, when a device was connected there. I don't think it recognized the capture card.) Since a passive one passes the signal to both ports no matter if a device is connected or not, I think that might actually work. Will keep you updated. What are you fellows talking about when you say "RCA"??? I got this - http://www.ebay.com/itm/6-Ft-DVI-TO-3-RCA-COMPONENT-CABLE-FOR-LAPTOP-PC-LCD-TV-/390410109253?ssPageName=ADME:X:AAQ:US:1123. I still haven't got it yet but it's great to hear that if it doesn't work, yours will. Thanks very much for posting it up. Yes it is passive. The one I had before was active but it didn't work. This one only works when both the TV and the Roxio are connected because otherwise I get lines all over the image and it flickers. P.S. When I wanted to look in this forums earlier yesterday I just got an animated message with music and stuff, that it was hacked and all data including passwords (hashes I hope) was dumped... What was it? Yes that was a hack on Invasion sites. Anyone reading this - just go with the splitter that Daku purchased. It works perfectly, is cheap and saves mucking around trying to get the right dvi/hmdi cable etc. The component/dvi cable I purchased was the wrong DVI input (DVI-D) so I just bought the splitter instead. It's perfect. That is GREAT to hear!!! Can you or Daku93 supply a link to one that worked for you?